Green Mountains, red barns, bucolic fields, covered bridges. Local crafts, craft beverages, specialty cheeses, abundant orchards. Vermont is close to perfect for artists. In addition to painting, my friends and I did a lot of eating during a recent “art weekend,” and so that is what you see here. 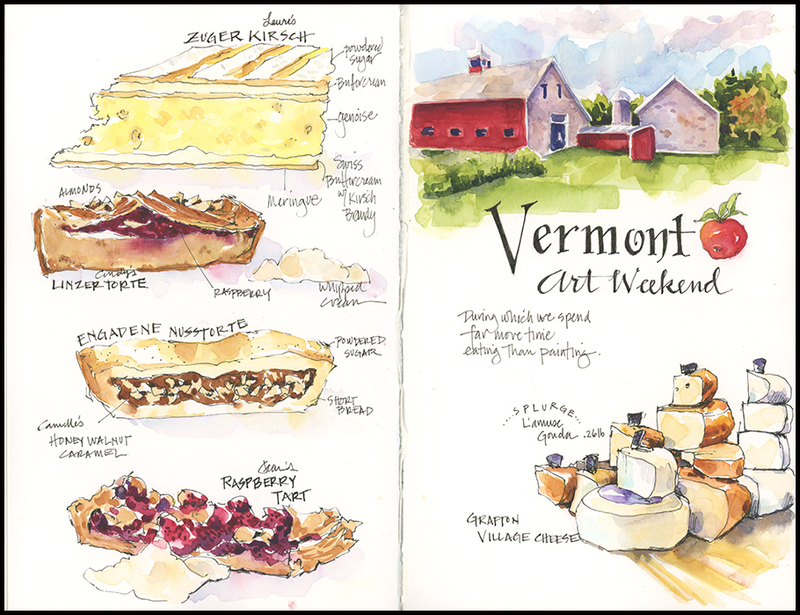 This entry was posted in Journal, Watercolor and tagged Autumn, food, travel sketching, Vermont, watercolor sketch by Jean Mackay / Drawn In. Bookmark the permalink. It’s interesting to see the leaves are only beginning to turn colors. The sketching is beautiful. It was surprisingly green…but this was last weekend. I suspect it is getting a lot more colorful now. Isn’t that why you go to those things? Welcome home. Always fun to get together with good friends and focus on art. And Vermont: a bonus. I’m lucky!